Remember how last time I said time was literally flying by? Well, spring registration is around the corner and I think everyone is a little confused on how we are already here. Midterms were already weeks ago, Thanksgiving is coming up, and if registration is almost here, that must mean finals aren’t too far behind. I think it’s really important to reflect on how you’ve enjoyed your classes this semester before jumping into registration. Picking out what you really liked, what you really didn’t like, finding professors who you have really clicked with, etc. is really important. When registration comes around, and it’s up to you to decide what classes you’re going to take to finish off the year, you want to learn from your past experience and make the most of what SJU can offer us. For me, personally, I have no idea what I’m going to be taking yet. Except for one class. This past semester I have been taking Italian 101 and I fell in love with the language and the culture instantly. I’m already trying to plan out when I can study abroad. 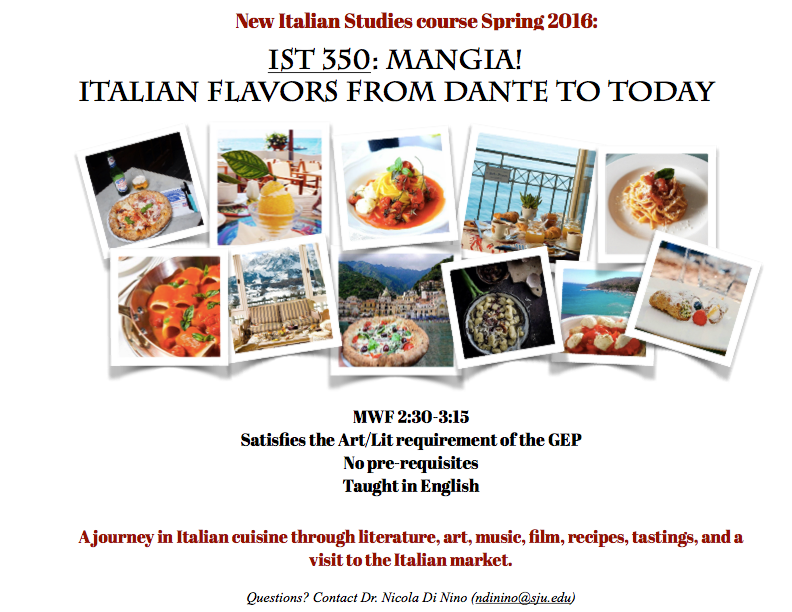 I know that I will be taking Italian 102 in the Spring, but when my professor, Dr. Nicola DiNino, told me about the new course he designed, I just knew it was going to be so much fun. I quickly jumped on the opportunity to help him with the course, we made flyers, we told everyone about it, and I know so many people who are excited about it! The course is IST 350: Mangia! Italian flavors from Dante to Today and the description is that it is “A journey in Italian cuisine through literature, art, music, film, recipes, tastings, and a visit to the Italian market”. Does that not sound like the best class? The best part too, is that it fulfills everyone’s Art/Lit GEP requirement and there are no pre-requisites so it’s the perfect class to throw into your schedule for some fun and cultural learning. (Really the best part is that the classes are going to be catered, so…. free food 😉 ). Saint Joseph’s is a school that prides itself on cultural and international diversity, and it really shows through the language department. It’s amazing to know that something that I am so interested in (Italian food, because who isn’t? ), especially as a Food Marketing major, is something I can actually take a whole semester-long course on in my freshman year! I encourage everyone to take a look at the course during registration, and try your best to fit it in your schedule!